Today it was announced that Fort Collins-based New Belgium Brewing has reached an agreement with Denver's planned The Source Hotel to have a new 10-barrel pilot brewery at the hotel. 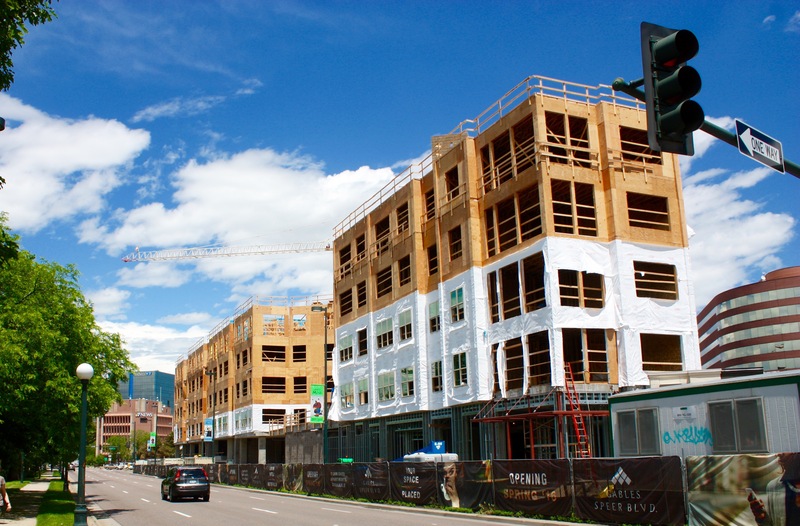 The Source Hotel is slated to take shape adjacent to The Source marketplace at the 3300 block of Brighton Boulevard in Denver's River North (RiNo) neighborhood. The beer will be brewed on the ground floor and an 8th floor lounge titled "The Woods" will feature barrel aging, and will provide visitors with a location to take in beer and food as well. 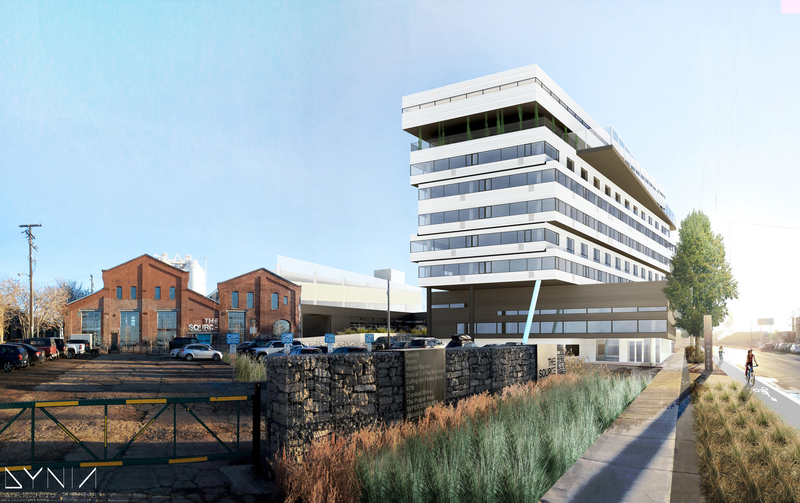 Rendering of The Source Hotel. 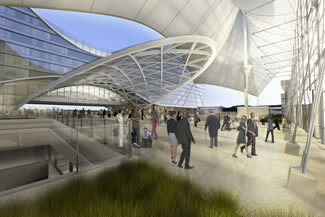 Image courtesy Dynia Architects. “After 25 years in Ft. Collins, we’re really excited to get more deeply involved in Colorado’s cultural and political capital,” said Jenn Vervier, director of strategy and sustainability at New Belgium. 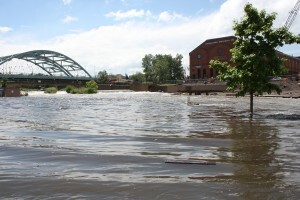 “We’ve long considered creating a Denver location to bring the New Belgium experience to more of our Colorado fans and to the millions of travelers who visit Denver. RiNo is already a vivid scene with a rich art and craft beer culture, and will soon have great access for bikers and walkers. This small batch brewery will allow us to collaborate with The Woods’ chef and mixologists to create innovative beers, drinks, and pairings you can’t get anywhere else. The Source Hotel and the Zeppelin Development team are the perfect fit.” The planned hotel is designed by Dynia Architects and is being developed by Zeppelin Development. Zeppelin and Dynia collaborated on The Source marketplace and the projects at RiNo's nearby TAXI campus. 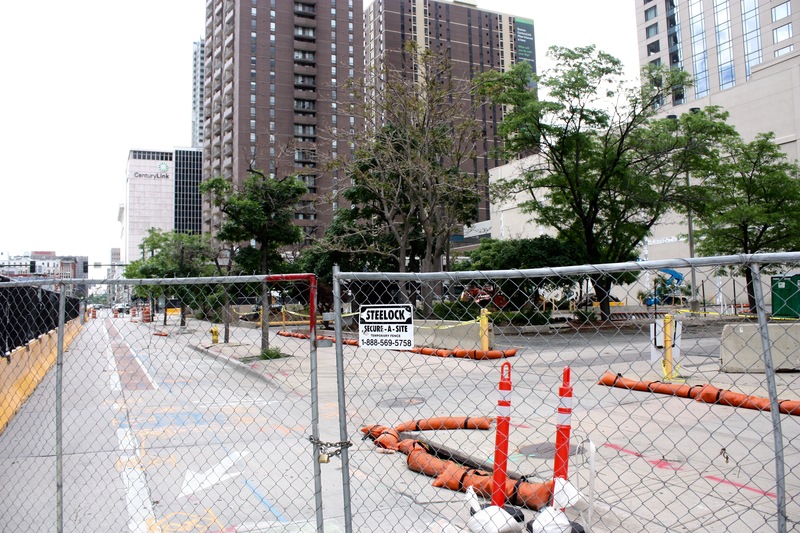 Construction on The Source Hotel is expected to begin this summer. 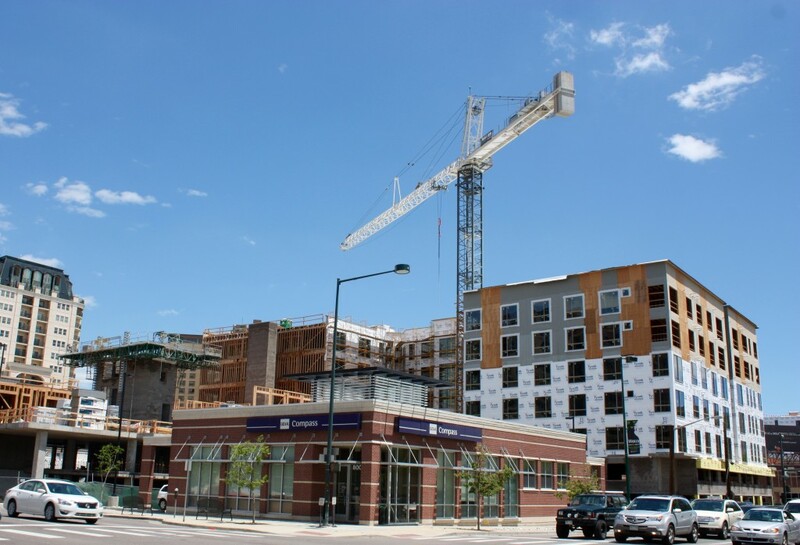 For more information on this project take a look at Denver Urban Review's first article on this hotel development by clicking here. 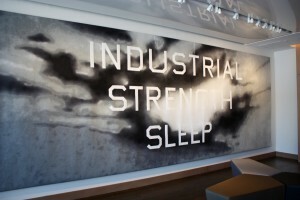 ART hotel Denver. DUR summer 2015. 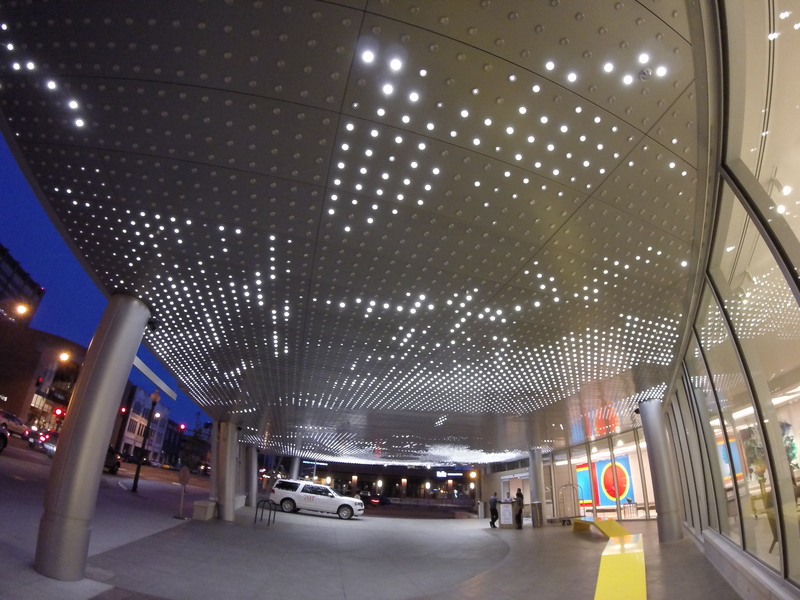 Arguably the most eye catching aspect of Denver's ART hotel that opened last week, is Leo Villareal's 22,000 LED bulb installation. The bulbs nearly stretch the entire block of 13th to 12th Avenue along Broadway. The lights are not static, but create an ever-changing luminous display. I filmed the installation and created the below video. I encourage you all to take a look at the display in person when you have the chance. Leo Villareal is also well known for his light installation on the San Francisco-Oakland Bay Bridge. ART hotel motor lobby. DUR summer 2015. 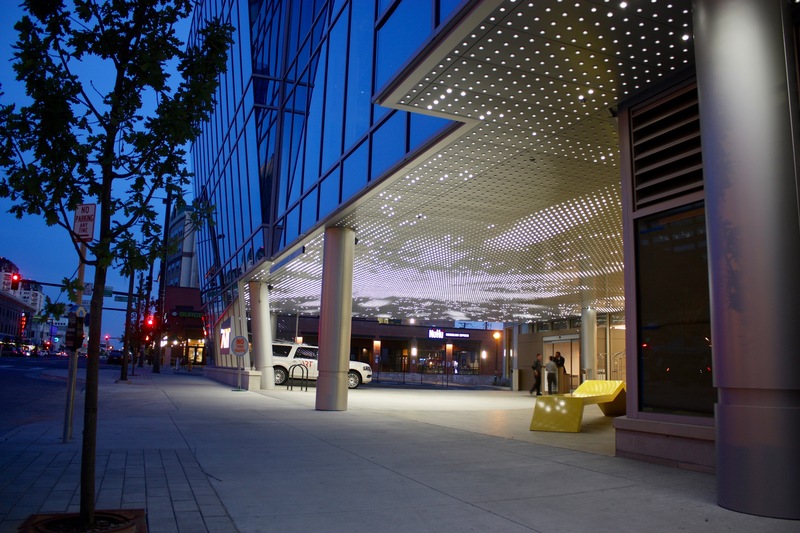 Situated on the same block as the Denver Art Museum and directly across the street from History Colorado, the ART hotel will add 165 hotel rooms to downtown Denver. This project was designed by architect Guadalupe Cantu of Davis Partnership Architects, which happens to be the same firm that worked with Daniel Libeskind when he designed the Frederic C. Hamilton Building addition to the Denver Art Museum. Works of art are displayed at every gathering place in the new hotel and selected works were curated by Dianne Vanderlip, former curator of modern and contemporary art at the Denver Art Museum. 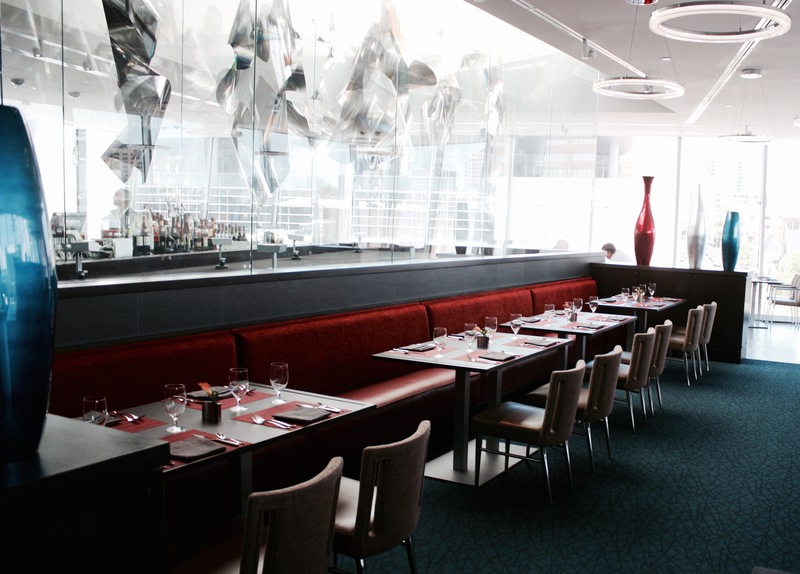 Fire Lounge & Terrace, a chef run restaurant at the ART, will also serve as an art gallery with original works on display. One of the unique features of the hotel is that each floor features selected works of art from an individual artist. Each hotel room on that corresponding floor has prints of the artwork. 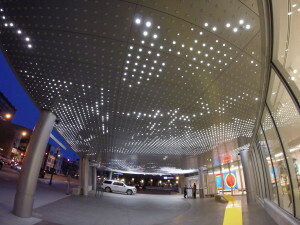 This week Denver's ART hotel opened and Denver Urban Review was on hand to tour this new addition to the Mile High City. Lanny Martin, founder and managing director of Platte River Equity and a development parter involved in the ART hotel was on hand and addressed the crowd that was in attendance for the opening luncheon. "Originally the plan was for this property to be a high-rise with residences in it. 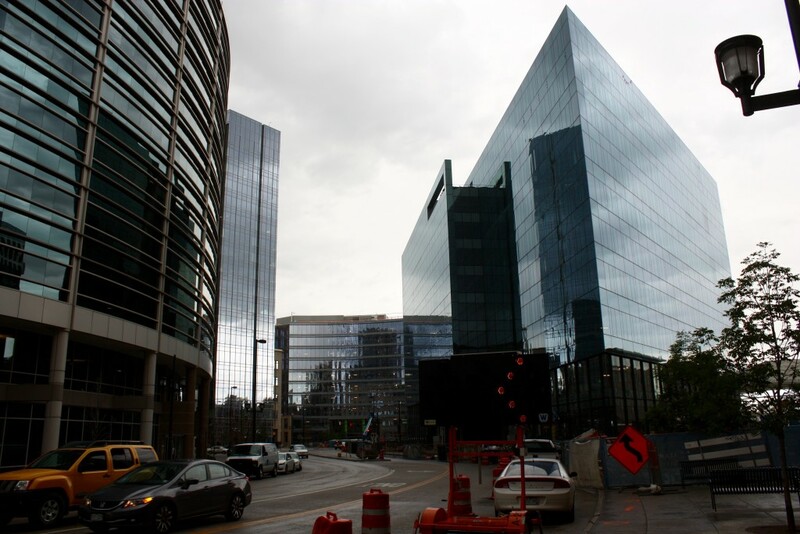 The economic downturn happened in 2008 and 2009 and laws in Colorado became tougher to build condos, so that project was put on hold. Bill Butler (founder of Corporex construction company) began talking to me about some ideas for the property, and Bill said how about a hotel?" Ground Floor entrance of the ART hotel. The painting on the wall is Sol LeWitt’s “Wall Drawing”. 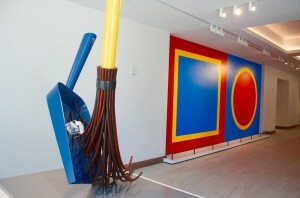 In the foreground is a miniature version of Claes Oldenburg and Coosje van Bruggen’s “Big Sweep” sculpture that is featured outside of the Denver Art Museum. FIRE restaurant at the ART hotel. 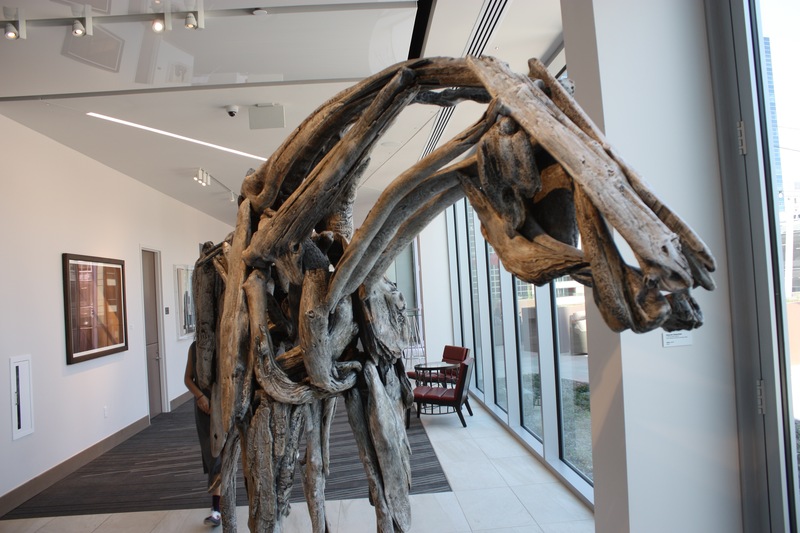 Works of art are displayed at every gathering place in the new hotel and selected works were curated by Dianne Vanderlip, former curator of modern and contemporary art at the Denver Art Museum. 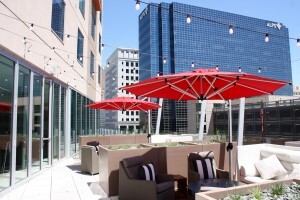 Fire Lounge & Terrace will also serve as an art gallery with original works on display. One of the unique features of the hotel is that each floor features selected works of art from an individual artist. Each hotel room on that corresponding floor has prints of the artwork. Ed Rushcha's piece "Industrial Strength Sleep" shown on the 4th floor lobby. The Art Hotel will feature 7,000 square feet of space that can be used for meetings, banquets and weddings. The exterior now showcases a large-scale light installation by artist Leo Villareal who is know as the artist behind the San Francisco Bay Bridge’s “Bay Lights.” The installation will include 22,000 LED bulbs that will stretch between the motor lobby and along a portion of Broadway. Airplane takes off at DIA. Image courtesy DIA. 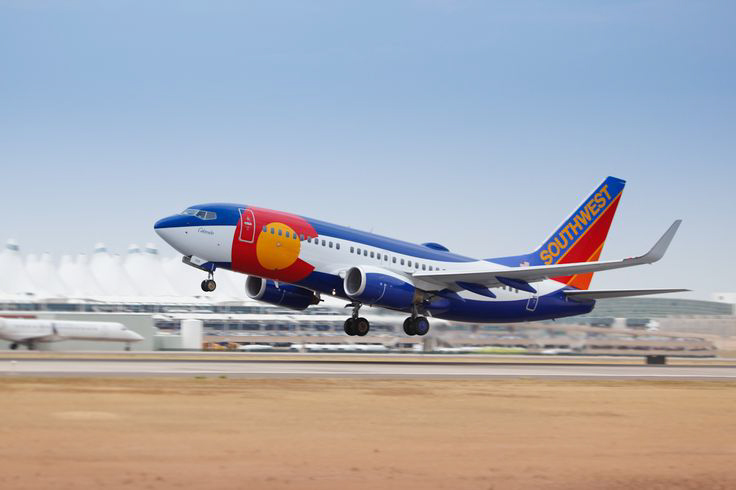 Work to resurface runways at DIA began this month with an estimated cost of $46.5 million. Runway 17L-35R will be closed until September 15th. The runway is 12,000 feet long and 150 feet wide and contains over 2,000 concrete slabs that are being removed and replaced. “DIA is now 20 years old, and there is an increased requirement for maintenance of the facility,” said Ken Greene, DIA’s chief operating officer. “Our robust pavement management program allows us to efficiently track the age and condition of more than 150,000 individual concrete panels on the airfield, and to make proactive maintenance decisions that will help to ensure the safe operation of more than a half-million flights a year." DIA also recently announced the DIA Westin will open to guests at 3 p.m. on November 19th, 2015. 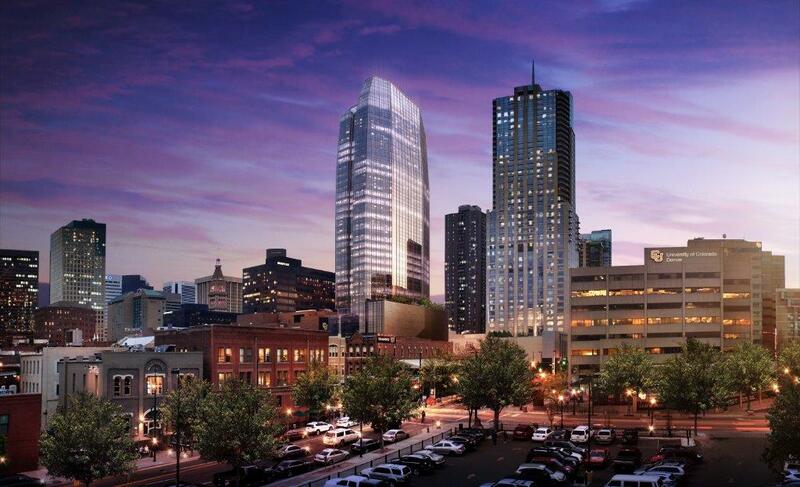 The Westin DIA will house 519 rooms in the 433,000 square foot, 14-story hotel. Rendering of Westin Hotel and public plaza. Image courtesy DIA. 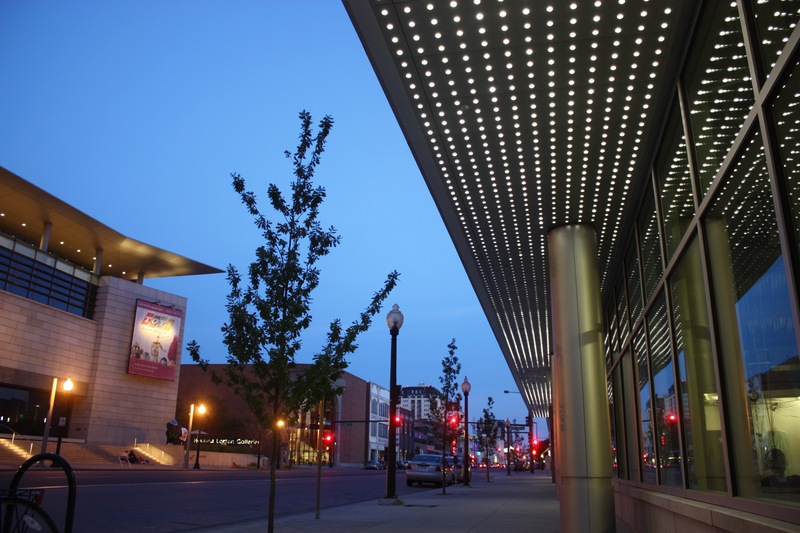 The Westin DIA has been constructed in concert with the airport's new transit center. In 2016 the East Line, a commuter rail line will open and provide a connection to downtown Denver on trains that will reach a top speed of 79mph. Trains will run every 15 minuets during peak hours along the 22.8 mile line and will deliver passengers from DIA to Denver's historic Union Station in 35 minutes. The hotel was designed by international design firm Gensler, which also designed the recently completed 16M mixed-use development in downtown Denver. 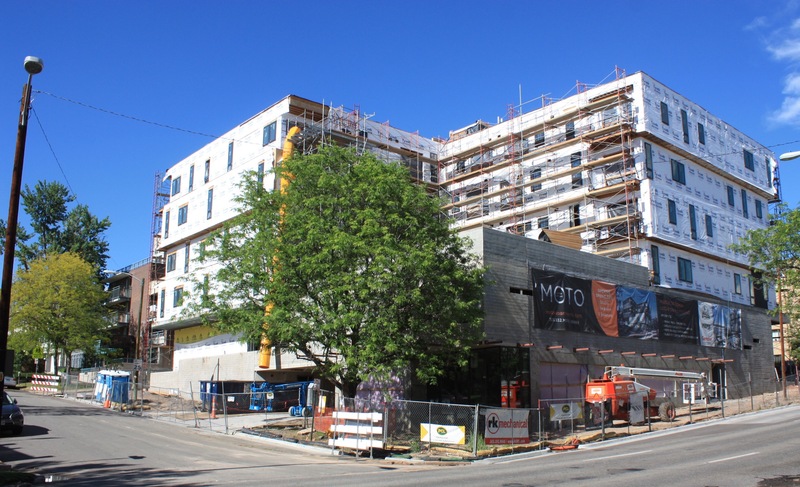 It has been a month since the last Denver construction update, which means it was time to grab the camera and take a look at the projects taking shape. 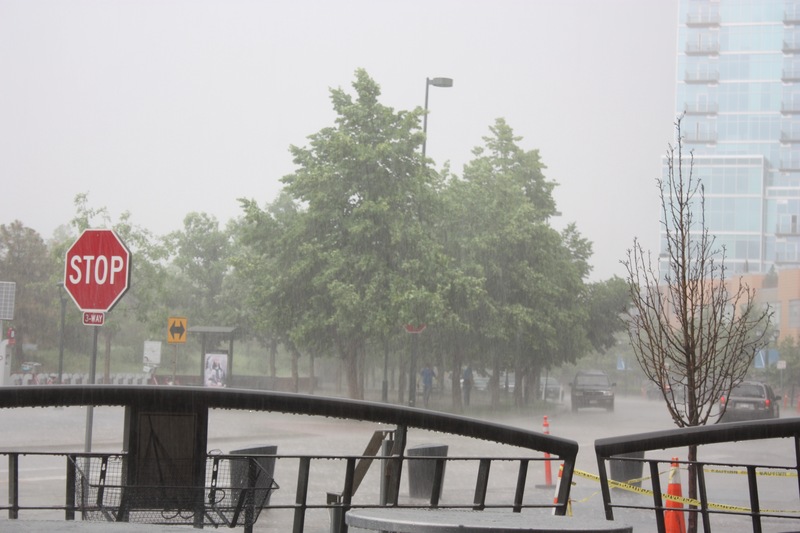 It was a another wild weather day in the Mile High City with two rounds of thunderstorms and periods of blue sky in between. Several events took place this weekend and it was great to see so many people out and about enjoying our city. This is also an exciting construction update as there are a couple of new projects that have joined the party. 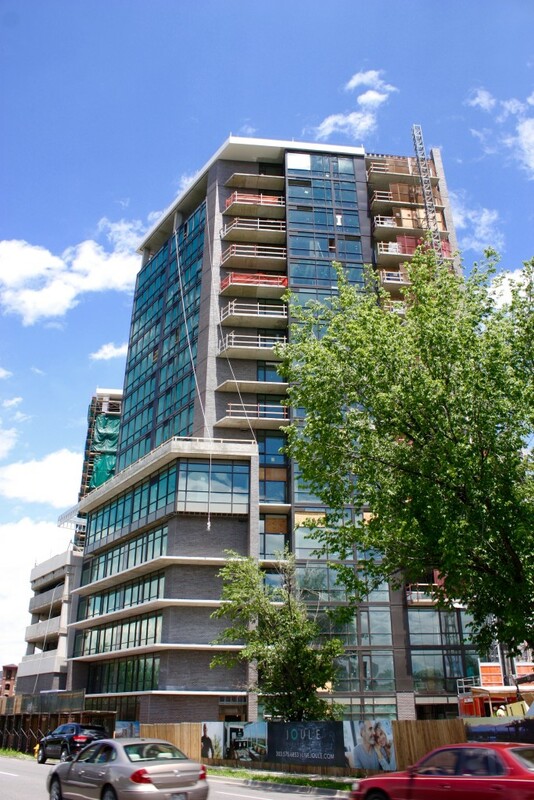 That being said, the first project on our June construction tour is the Country Club Towers. Prep work at this site has been taking place for the last few months, but now construction is taking place in earnest. This project will include two 30-story residential towers. 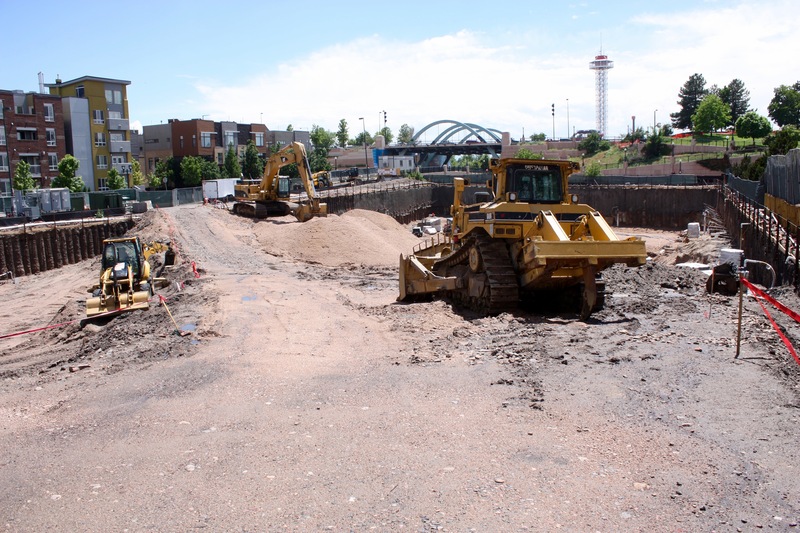 The Broe Group is developing this project just west of Downing Street and on the south side of Speer Boulevard. 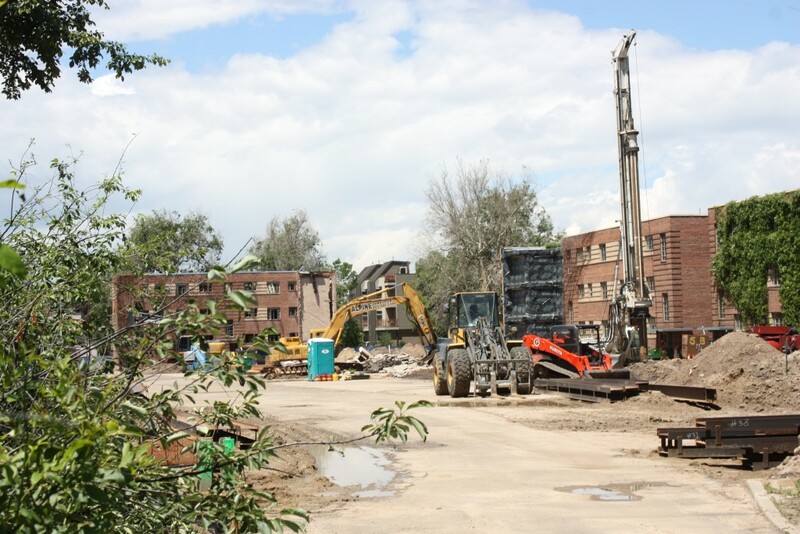 The Speer Boulevard Apartments are featured in the below photo at Speer Boulevard and Grant Street. 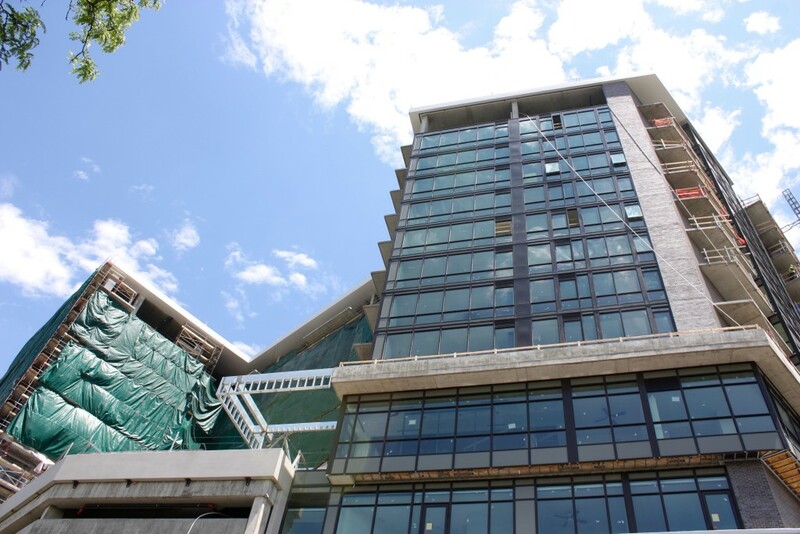 This residential project has one more floor to go before it tops out at 6 stories. The base for a construction crane has been installed at the site of the 7|S Denver Haus apartments. Once completed this project will include 115 apartment units. Also under construction in Denver's Capitol Hill neighborhood is MOTO apartment project at 8th and Sherman Street. Pictured above is the 8th Avenue and Broadway apartment project. The exterior finishes are now beginning to be applied. 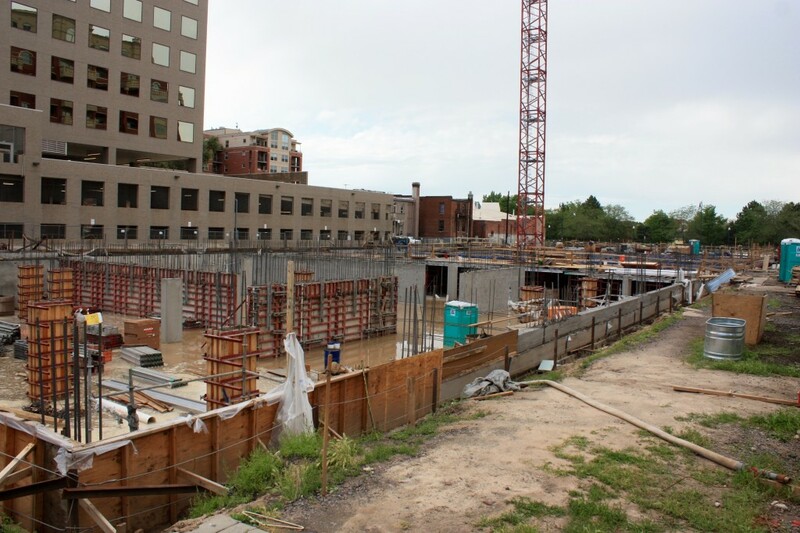 Below are two pictures of the Joule apartment project that is under construction in Denver's Golden Triangle neighborhood at Speer Boulevard and Cherokee Street. This development is seeking LEED certification. As the midday sun was reaching its peak in the sky, the clouds began to thicken. I proceeded north where I snapped a picture of the dual brand Hyatt House/Hyatt Place Hotel. Exterior work on this project is nearing completion. 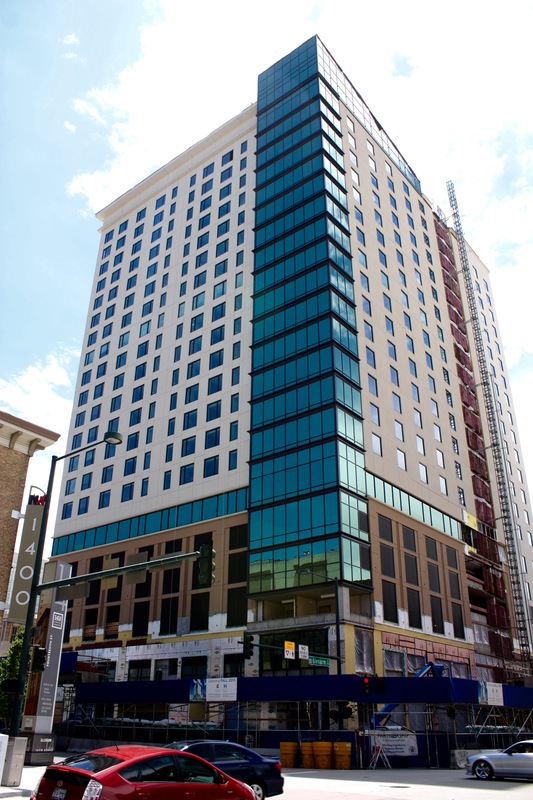 This 21-story hotel is slated to open this fall. 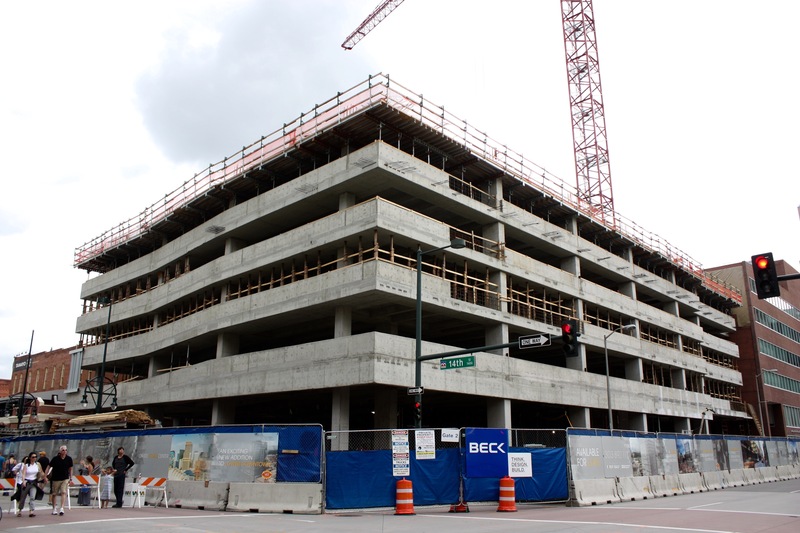 Here is a most exciting addition to the construction update, the 40-story 1144 Fifteen Street skyscraper. 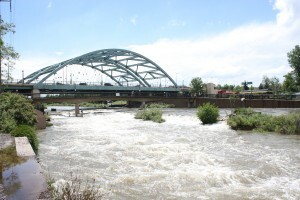 Denver Urban Review published the new renderings of this project and to see all 5 renderings, take a look at Friday's article. The construction fence is now up at the 1144 Fifteenth Street site. Construction will begin in earnest in the coming days. 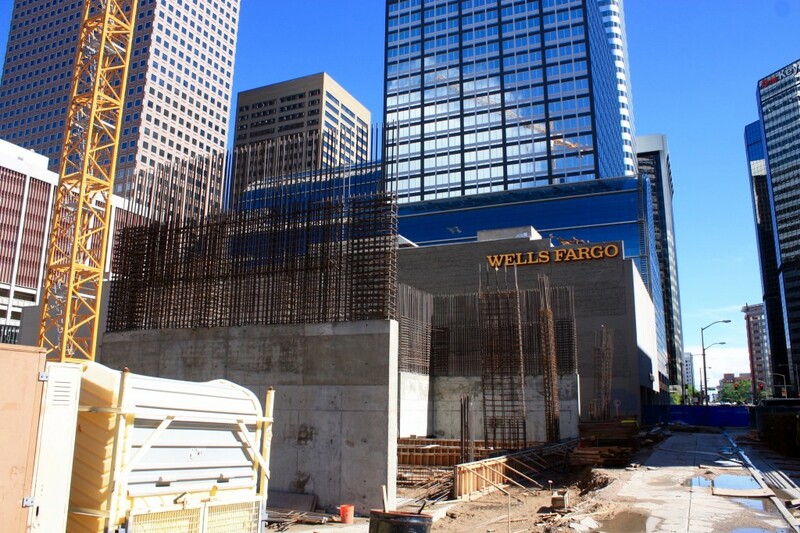 At Fourteenth and Lawrence of course is the 22-story 1401 Lawrence office project that is under construction in downtown Denver. 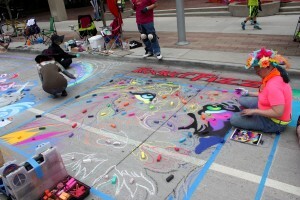 Below is a picture of the Denver Chalk Art Festival that was taking place in and around Larimer Square. Not exactly construction related, but for sure one of Denver's great annual events. Unfortunately just a few minutes after I walked through the festival the weather quickly changed moods and a tropical downpour began. 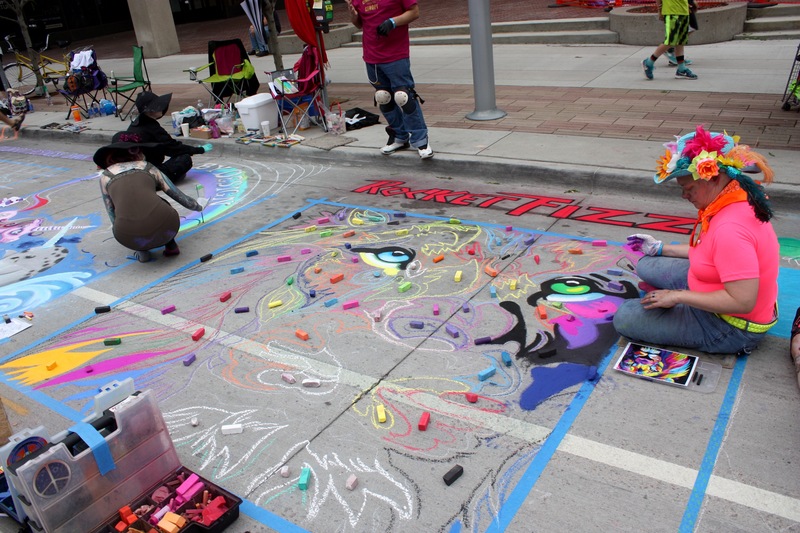 Not sure if the artists use some kind of special chalk, because it looked like the artwork was not ruined from the rain. Looking down Wewatta towards 16th Street is the Triangle Building where the last phases of construction are taking place. It was at this point that the downpour began and I scampered to the nearest coffee shop to keep the camera out of the rain. 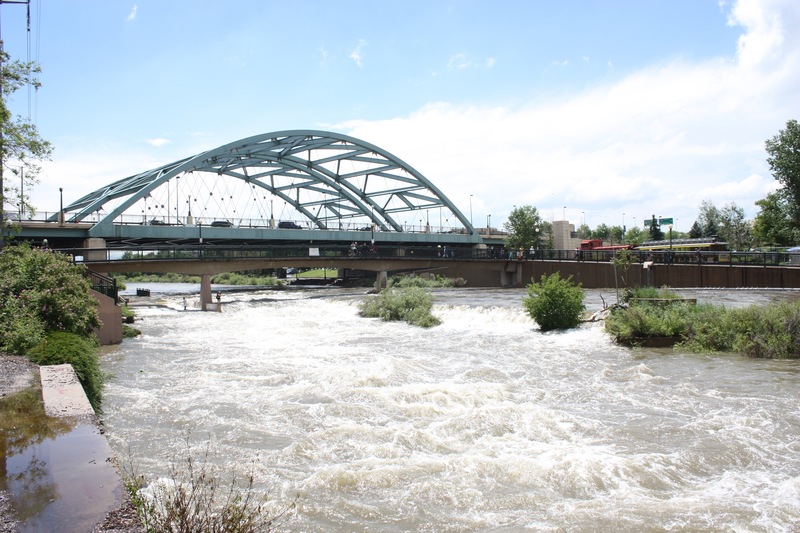 The clouds parted just as fast as they arrived and since I was in the area, I wanted to see how the Platte River and Cherry Creek were looking —I have never seen that much water in Confluence Park before Anyways, getting back to the construction tour. The next project on our list is the 34-story Confluence luxury apartment project at 15th Street and Little Raven. Excavation work continues on this project. Over in the Union Station neighborhood is 10-story 1601 Wewatta (above) office building that is being developed by Hines. 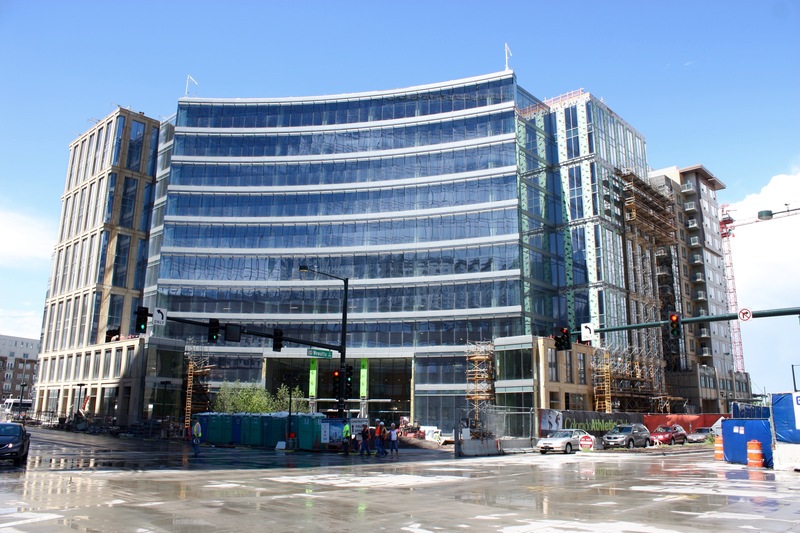 Last week it was announced that two tenants have signed to lease space at 1601 Wewatta—Hogan Lovells LLP will lease office space and the Colorado Athletic Club will be opening a fitness center in the building. 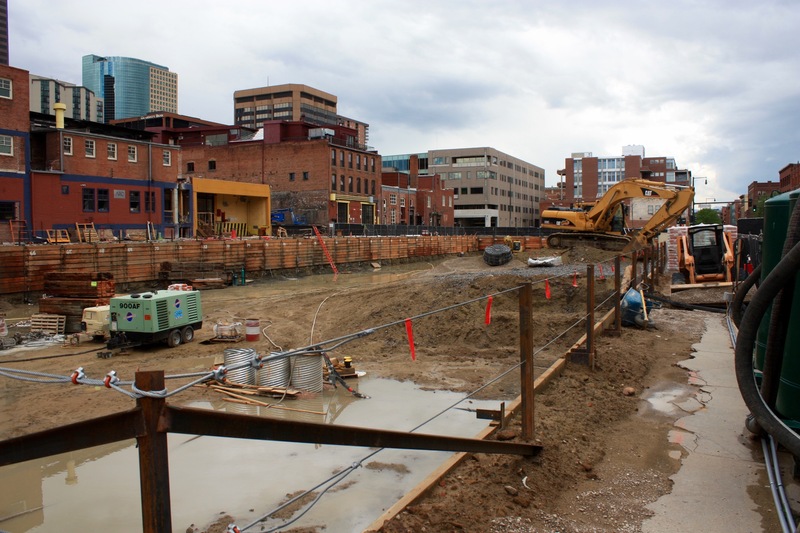 Seen below is the construction site of the Kimpton Hotel. This project will also include a boutique office space. Pictured below is the construction site of the 17W mixed use development that will feature a Whole Foods on the ground floor and 600 apartment units. The total height of this project is 13 floors. Shown above is the Union Tower West construction site. This mixed-used development will showcase a boutique hotel as well as leasable office space contained within a 12-story building. Union Tower West will take shape at 18th and Wewatta. 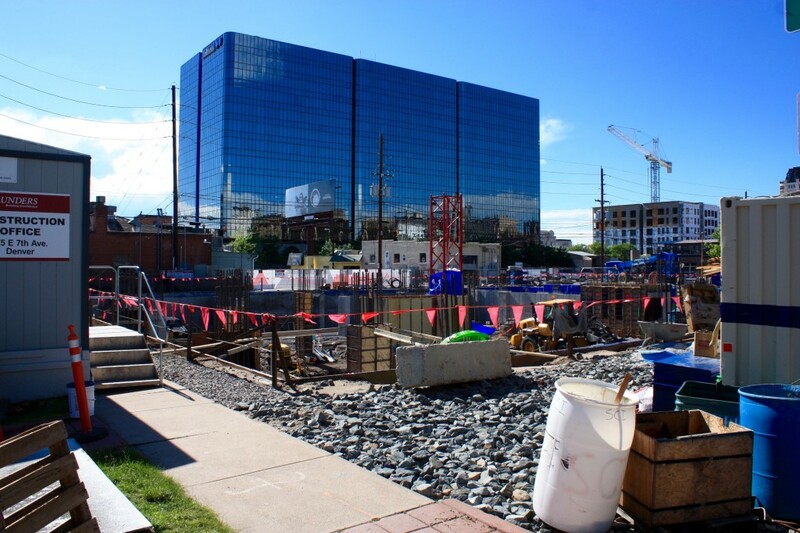 Work is wrapping up on the Elan Union Station project at 19th Street and Chestnut Place. 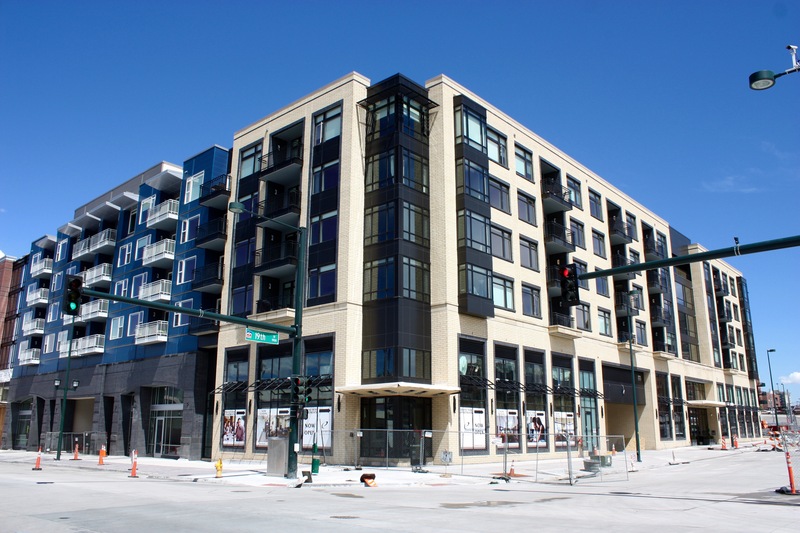 This project will feature a King Soopers on the Ground floor. 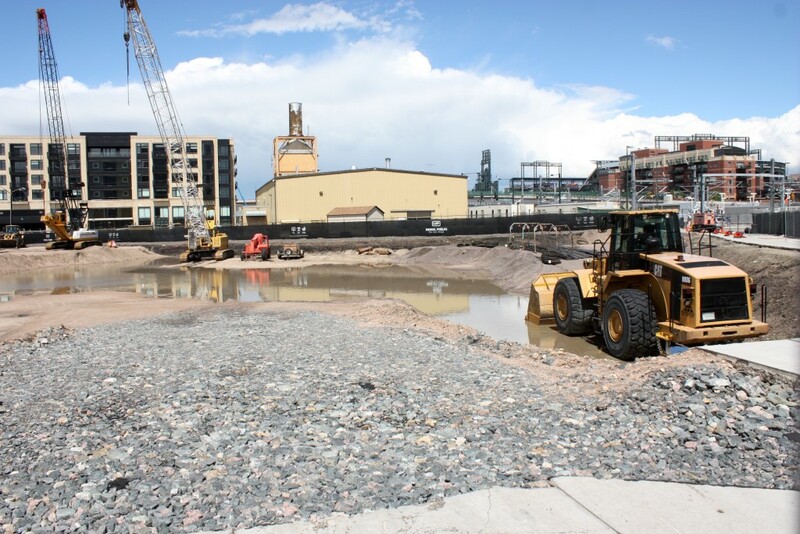 By the time I had made my way to LoDo to take a look at the progress of the Z Block project the clouds had returned. 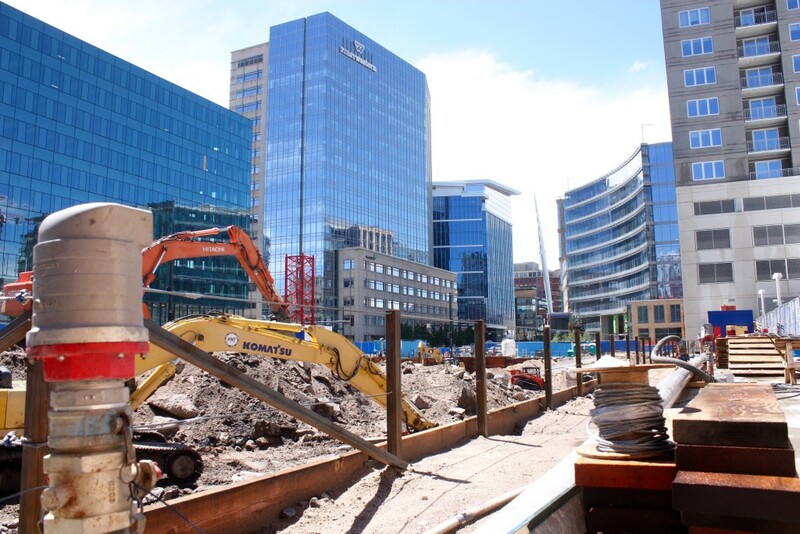 A great deal of excavation work has taken place at the Z block site in the last month. This project will feature a hotel managed by Sage Hospitality and 200,000 square feet of office space. Prologis recently announced that they will be leasing space in this building. 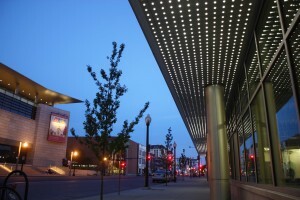 Z Block is seeking LEED Gold certification. Pictured below is the Alexan Uptown residential project at Logan and 19th Avenue. It will feature 372 apartment units in a 12-story building. 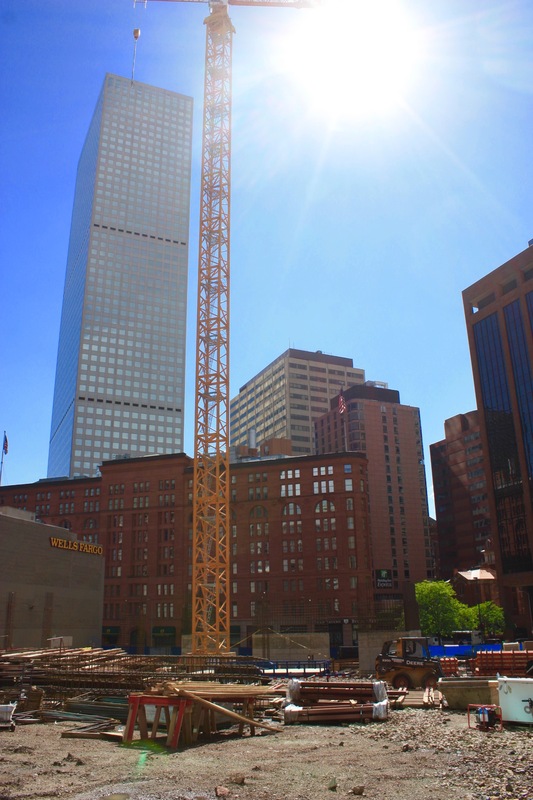 The sun came out for the last stop on our Denver construction update. The 26-story SkyHouse project has just begun to go vertical at 18th and Broadway. I hope everyone has a good week and thank you for stopping by. 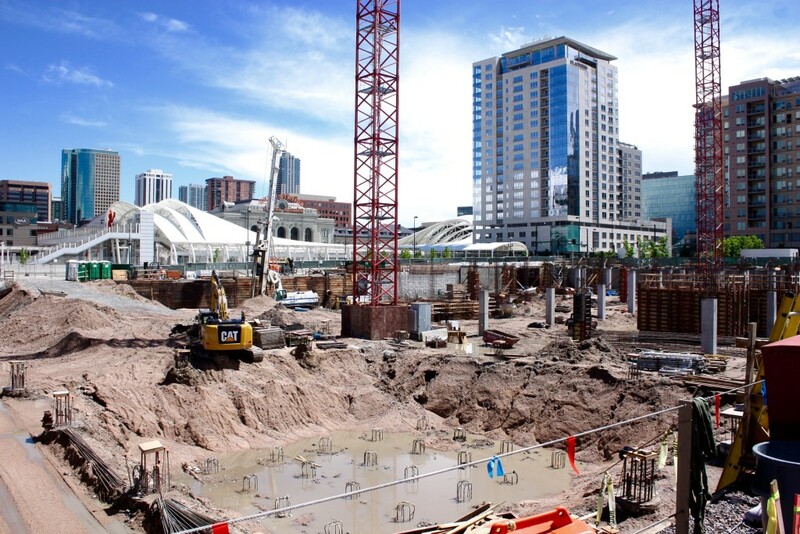 There really is a ton of construction going on around Denver these days. The next few months will be exciting as several of these projects are moving from "hole in the ground stage" to going vertical. Cheers, Justin P.S. 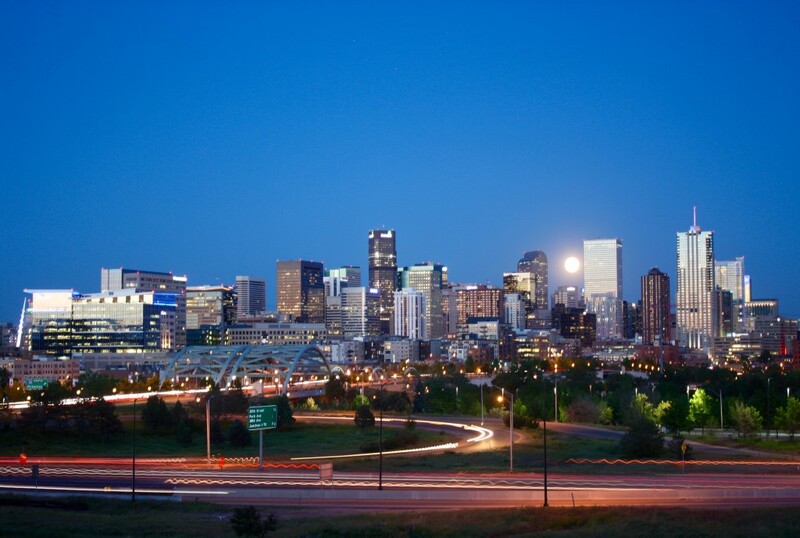 below is a photo of the Denver skyline I captured from Diamond Hill last week when we had the full moon. Denver Skyline from Diamond Hill. DUR June 2015.